Ductile shear zones localise tectonic stresses and accommodate plate motions in the middle to lower crust and mantle, and control the strength of much of the Earth. Despite a common assumption that ductile shear zones deform under nominally steady-state conditions, changes in stress and strain rate are anticipated during shear zone formation and localisation, and in mid-crustal shear zones which are periodically loaded from above by earthquakes. Here, the microstructural response to changes in stress and strain rate is explored with particular emphasis on the evolution of grain size, crystallographic fabric and dominant deformation mechanism. A broad range of techniques have been applied, including electron backscatter diffraction (EBSD), titanium-in-quartz (TitaniQ) thermobarometry, numerical modelling of grain size evolution and Griggs apparatus experimentation. For context, quartzofeldspathic mylonites of the Alpine Fault zone (AFZ) of New Zealand have been studied and are used to relate numerical and laboratory studies to nature. During shear around rigid garnet porphyroclasts, quartz in the AFZ mylonites undergoes grain size reduction by dynamic recrystallisation in response to increasing stresses and strain rates adjacent to a porphyroclast. Meanwhile, quartz [c]-axes reveal increasing amounts of slip on rhomb <a> and prism <a> planes. These results are replicated in the laboratory by shear of quartz around alumina piston asperities, during which prism<a>slip becomes dominant and resistant to subsequent replacement as stresses reduce. Recrystallised quartz grain sizes in the AFZ mylonites are consistent with differential stresses of ~50 MPa, which are well replicated by finite element models using quartz rheological data. Quartz deformation in the AFZ mylonites ceased at around 500_C, as recorded by the preservation of grain boundary migration microstructures and titanium-in-quartz concentrations, which appear well equilibrated due to rapid grain boundary migration during deformation. Rates of grain size increase downshear of garnet porphyroclasts far exceed laboratory-measured rates of static annealing. This discrepancy probably reflects the additional contribution of internal strain-energy driven grain boundary migration to surface-energy driven grain growth, enhancing grain growth rates in favourably oriented grains at the expense and ‘elimination’ of unfavourably oriented grains. In experiments simulating rapid strain rate changes analogous to mid-crustal seismic stress cycling, plagioclase aggregates undergo rapid dynamic recrystallisation during a strain rate increase, and are remain weakened long after strain rates and stresses return to ambient levels. The longevity and degree of mechanical weakening depend on the rate of grain growth to re-establish steady-state conditions, and the dominant deformation mechanism. If dislocation creep is dominant throughout a strain rate perturbation, no mechanical weakening is observed. However, if grain size sensitive processes of diffusion creep and grain boundary sliding dominate, mechanical weakening is achieved. Grain size reduction in response to a stress increase is inferred to cause weakening of a crystallographic fabric through enhanced grain boundary sliding, though fabric weakening appears slow. In numerical models of grain growth during a postseismic stress and strain rate drop, rapid rates of grain growth are required to re-establish microstructural steady-state conditions on timescales equivalent to typical earthquake recurrence intervals. 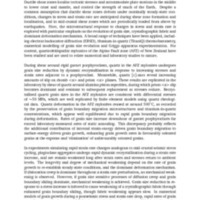 Despite this, dynamic grain growth rates calculated for natural AFZ quartz are sufficiently rapid to allow at least a partial return to steady-state during a typical 300-year AFZ interseismic period. Cross, Andrew James, “Microstructural evolution under non-steady state deformation in mid-crustal ductile shear zones,” Otago Geology Theses, accessed April 22, 2019, http://theses.otagogeology.org.nz/items/show/597.